Chris Boyd is ready to arrive with 'a new broom' as he bids to bring silverware back to Saints. The Kiwi coach will come in as the club's new director of rugby following the conclusion of his duties with current team, Super Rugby side the Hurricanes, this summer. Saints are in need of a fresh approach, having struggled during this season, with long-serving boss Jim Mallinder paying the price for their poor form back in December. 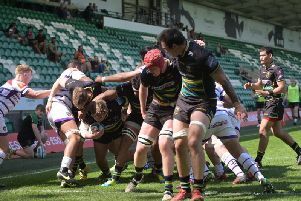 The black, green and gold were eliminated from the Champions Cup at the pool stages, lost in the Anglo-Welsh Cup semi-finals and currently sit 10th in the Aviva Premiership. And Boyd, who spent last week assessing the situation at Saints during a one-week break from the Super Rugby season, knows exactly what is needed at his new club. "It's been a tough year for the Saints with the change of staff and the cloud hanging over what's going on," he said. "I think they have managed pretty well despite those issues. "It's been tough, but what it does is it gives us an opportunity to come in with a new broom, have a sweep, get a refocus around what it is to be a Saint and what we want to achieve. "It's a bit of a new beginning." When asked for his message to Saints supporters, Boyd said: "One of my biggest hopes here is that we can engage our people. "I just want people to be proud of the way Saints play. "Winning is important and every single game we play, we want to win. "I just want us to play a good game of rugby that people enjoy coming to watch." And he added: "In the bracket of conservative to optimistic, I certainly sit right down the optimistic end. "Winning is really important in high performance sport, but I also want people to come to Franklin's Gardens and enjoy the spectacle and know the boys are trying really hard. "As a supporter, you can have some disappointment about the final score, but if you can really buy into the fact the players are giving it their all for their team, that's a really important thing." Boyd, who steered the Hurricanes to Super Rugby glory in 2016, is well aware of what lies ahead for him in England. And he said: "There's certainly challenges. The thing that's challenging me is the unknown. "I have a clear idea of the way I want to play the game and that all relates to the southern hemisphere stuff. "One of the things that is important for me is to get a handle on the differences between the north and the south and how the rugby can be played - just the culture of the game. "I'm a bit of a tragic. I subscribe to a European rugby channel in New Zealand and I watch quite a bit of the Premiership and the French league and Celtic league. "There are differences in the game and adapting the game to how I think Northampton should play is going to be critical."